Honorable Peter E. Schoon Jr. The Eighth Judicial District Commission on Judicial Performance unanimously recommends that Judge Peter E. Schoon Jr. BE RETAINED. Judge Schoon received his Juris Doctorate degree from Washburn University of Topeka (Kansas) and his undergraduate degree from Central College (Pella, Iowa). 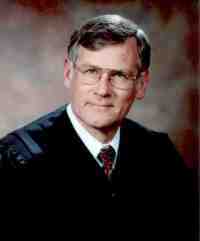 Judge Schoon was admitted to the Colorado bar in July 1976. The Honorable Peter Schoon was appointed to the Larimer County Court on September 2, 2002 and took the bench in February 2003. Prior to his appointment, Judge Schoon was a lawyer in private practice in Loveland, Colorado with an emphasis in civil law. Along with his twenty-seven years in private practice, from 1988-2002, he also served as an Associate Judge of the Loveland Municipal Court. He has attended the National Judicial College and served as group facilitator for its Special Court Jurisdiction: Advanced course. Judge Schoon’s court handles a mix of traffic (17%), misdemeanor cases (20%) and civil cases (63%). Non-attorneys who responded to the survey questionnaire cited his fairness and calm demeanor. Attorneys who responded to the survey questionnaire spoke to Judge Schoon’s fairness, impartiality and ability to help defendants understand proceedings. While Judge Schoon tries to provide a less formal and rigid courtroom atmosphere, survey and interview input received by the Commission raised concerns that Judge Schoon’s sense of humor can be interpreted as sarcastic and inappropriate. The Commission finds him to be consistent in his rulings with a thorough knowledge of the law. Judge Schoon’s opinions are well written and he is credited with timely rulings. Judge Schoon notes that the County Court is often the public’s only contact with the court system. He believes that it is the judiciary’s role to address individual rights while promoting individual responsibility in a courteous, competent, and timely manner. He has met the goals inherent in this evaluation.